There are very many types of rice: long, medium and short, each can be used in many different ways, from a savoury pilaf, to a creamy risotto, to a dessert rice pudding! 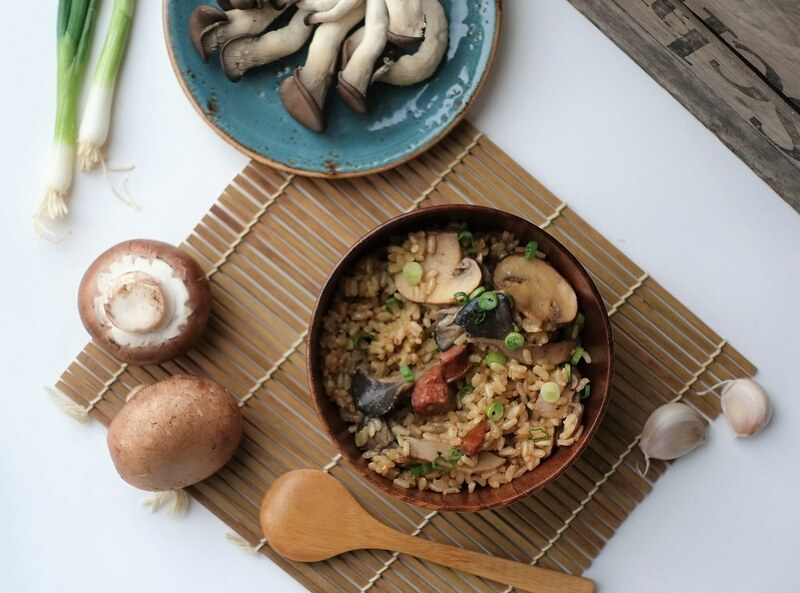 Brown rice has the outer hull removed but still retains the nutrient-dense bran layers that give it a tan color, chewy texture and nutty flavor. Brown rice is a 100% whole grain, rich in minerals and vitamins, especially the B-complex group. In variants of either long-grain or short-grain rice, the colouring you see is simply nutrients! The flavour profile is nutty with more of a bite than white rice. 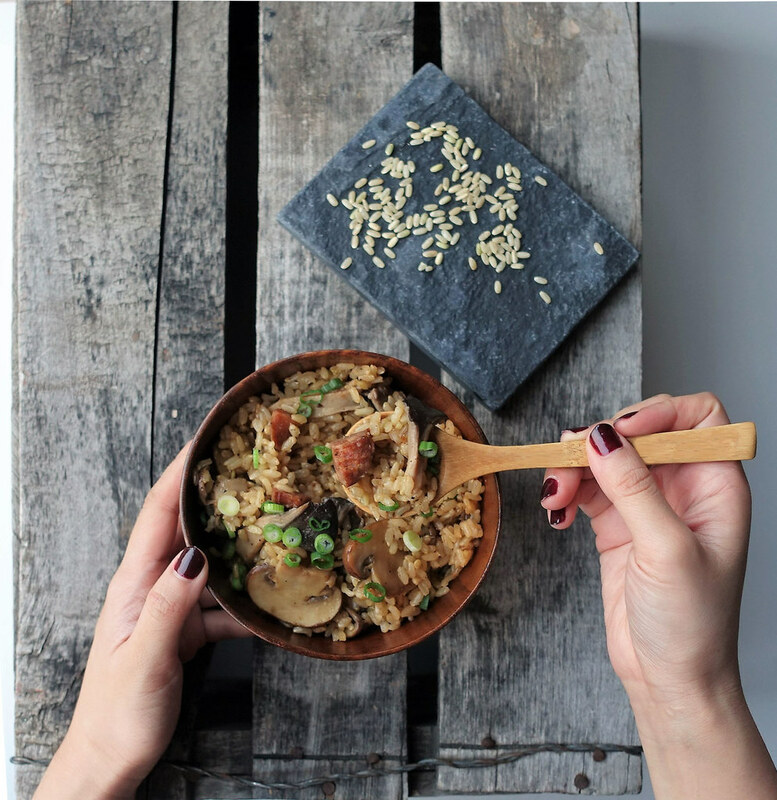 Once cooked, brown rice can keep in the fridge from 3 to 5 days and up to 6 months in the freezer. Canada does not produce rice. It grows wild rice, which is not a true rice, but the seed of an aquatic grass. The majority of rice on store shelves that is consumed in Canada is grown in the U.S. Essentially, U.S.-grown rice is as local as it gets for Canadians. Together, Arkansas, California, and Louisiana account for about 80% of U.S. rice acreage and production. Rice is currently cultivated in more than 100 countries, feeding 2/3 of the world! In many of these countries, entire populations rely on rice as their principal form of nourishment. I picked up a U.S.-grown brown rice from Sacramento, California from my local grocers. For my recipe, I made a visit to the bustling North St. Lawrence Farmers Market to be inspired by the local produce and flavours(open 5AM-3:15PM on Saturdays). I picked up two varieties of mushrooms, smoked jalapeno & cheese sausages, a few heads of garlic and green onion. 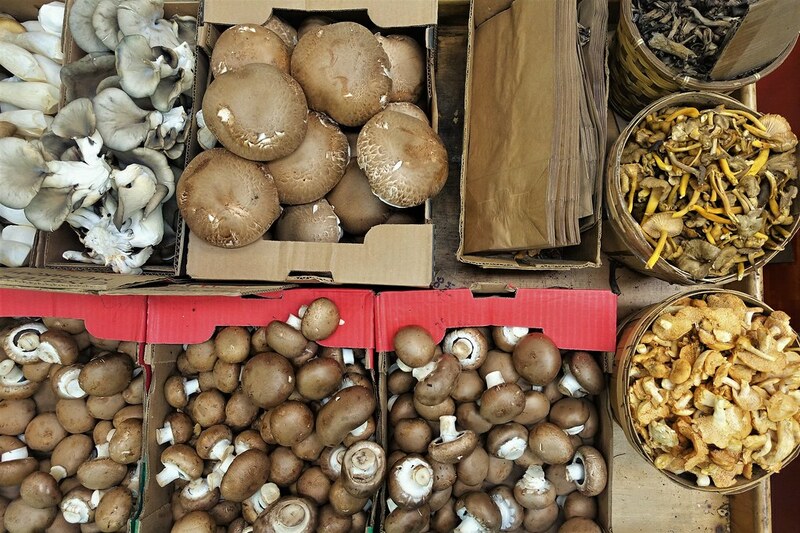 For mushrooms, I was looking for varieties that were sturdy and could hold their own with much heat and simmering. I selected Black Oyster and Cremini Mushrooms. 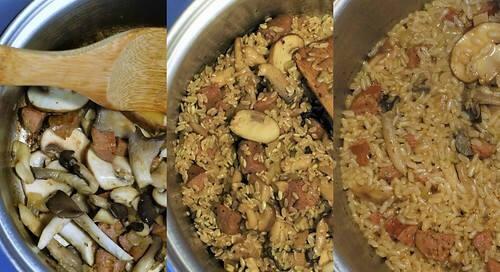 My three pieces of advice for cooking brown rice: Wash, Toast and Rest. 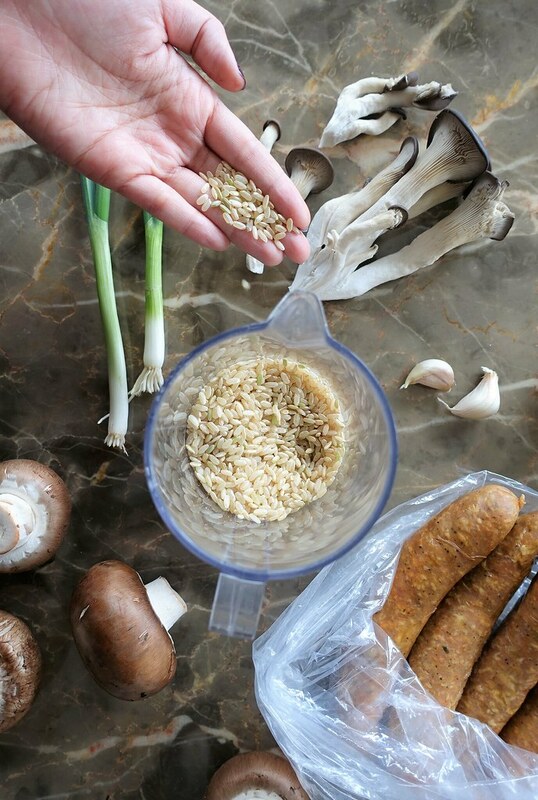 To wash the brown rice, use a bowl and rinse twice. Fill the bowl with one cup of rice and three cups of water to massage thoroughly until no further discolouration appears in the water. Drain the water and fill the bowl once again to wash it a second time. To toast, this comes before the boiling process on the heat. Add the washed brown rice to your pot and stir. A nutty, earthy fragrance will come about and this is exactly what we want for a more complex taste. Toast for 3 minutes. To rest, this comes after the boiling process and you are left with a pot of gummy-looking rice. Take the pot off the heat and keep the lid on. The steam from the rice will continue to absorb within the rice allowing fluffier rice which will separate upon scooping. Leave to rest for 10-15 minutes. Wash the brown rice, drain and set aside. Melt butter or oil in a pot. Add onions and cook until slightly translucent. Add in garlic and stir until fragrant. Add in sausages first to cook thorough (optional). 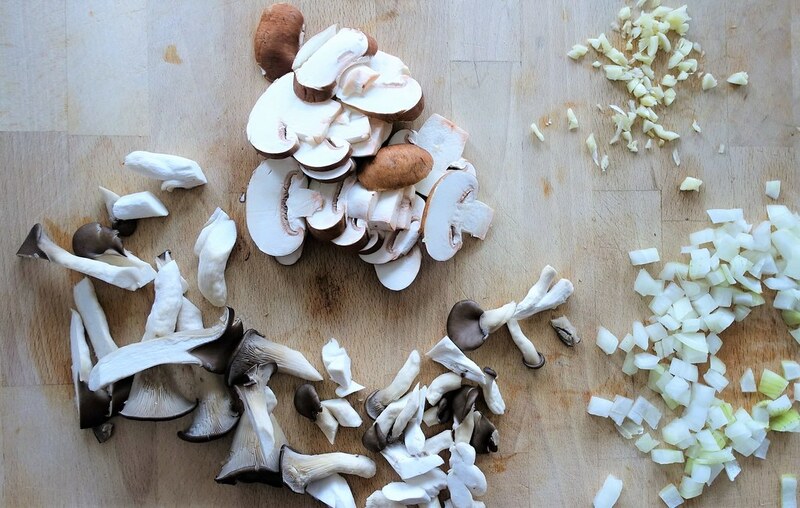 Then add mushrooms and cook for 3 minutes. Pour washed rice into pot and stir into ingredients to toast for 5 minutes. The ‘toasting’ step can be skipped, but it is my preference as it unveils deep nutty flavour and a more complex taste. Add 1 cup of broth and 1 cup of water to pot at a 2:1 water to rice ratio. This ratio depends on your rice packet’s instructions, mine needed a 1/5 cup more water. Add salt and pepper to taste and stir. Bring to a boil occasionally mixing for 5 minutes. Make sure nothing sticks to the bottom. Switch heat to low, cover with lid and allow to simmer for 30-45 minutes. Minimal check-ins (see photo below for guidance). Once cooked, take the pot off the heat and cover with lid for 10-15 minutes to allow to rest. This step traps in all of the steam and ensures fluffier, thoroughly cooked rice. It is a must to taste the rice to see if it’s ready after 45 minutes, if it’s still hard, it will need more water and another 10 minutes to simmer with the lid on. At the 25 minute point, the rice becomes semi-translucent with rapid bubbling through holes. At the 35 minute point, holes are more visible with continual rapid bubbling. And, voila! A fresh steamed pot of fluffy brown rice. I can see this as a keeper in the pantry. With it’s nutty quality, brown rice would be a great addition to burritos. I made this recipe twice in a day. 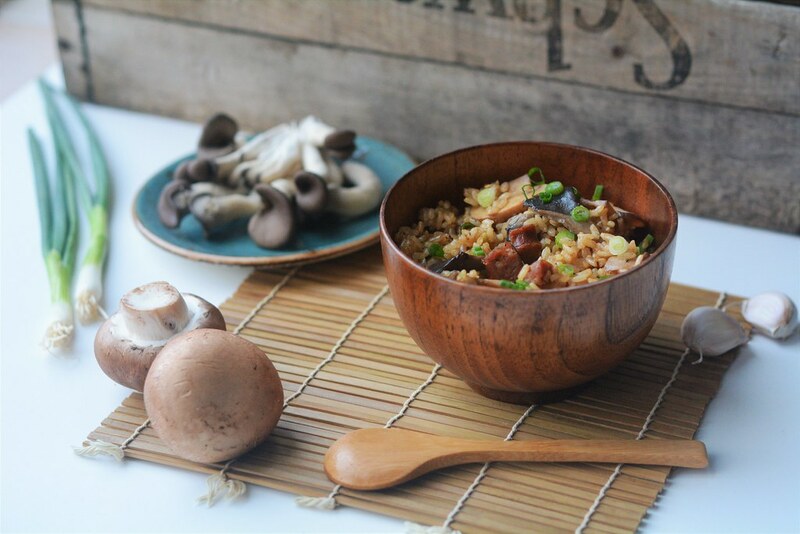 The second time, I didn’t add sausages and it was already very rich and flavoursome with only mushrooms. USA Rice provided me with this opportunity to experiment with a new staple and I loved it! 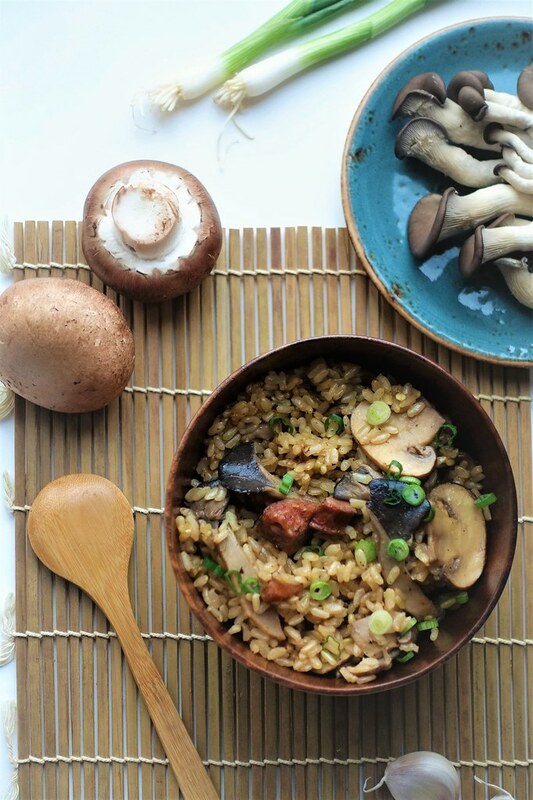 If you’re interested in discovering the delights of USA Rice, visit their website and try out some fellow bloggers recipes out for yourself! Your photos are stunning! This is one beautiful (and healthy!) dish. You’re so kind, thank you! The dish was very simple to whip up and I was very pleased with the tasty results! And, so much fun to make! mmm. . . the pilaf looks yummy.